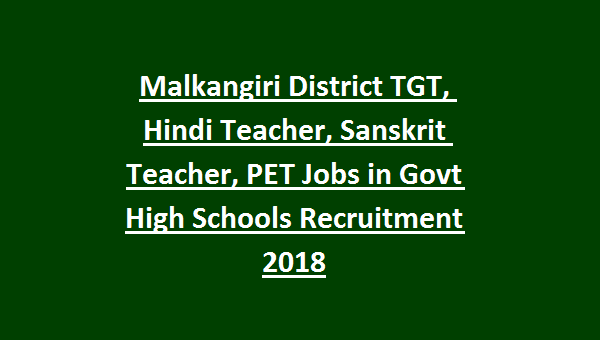 in this Malkangiri District TGT, PET Teacher vacancies recruitment 2018. Applications in a prescribed format only accepted for this Malkangiri District Govt Girls High Schools. Download application form from the official website of www.malkangiri.nic.in. Candidates selection will be based on merit in qualifying exams marks percentage. Candidates who is qualified B.Ed with Degree in respective subject and OSSTET qualified, they are only eligible for this Malkangiri District Contractual Teachers Jobs. Detailed information is given below. Last date to submission of application form to District Welfare Officer,Malkangiri District is 22-12-2018. 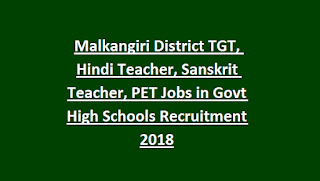 There are total 65 posts in this Malkangiri District Recruitment 2018. As on 01-1-2018 candidates age limits are 21-32 years. For SC/ST/SEBC candidates 5 years of upper age relaxation is applicable. For all the posts B.Ed with Degree in respective subject is mandatory. OSSTET qualification is mandatory to apply for this Malkangiri District SC ST Development Teachers jobs in Govt High Schools/ Girls High Schools. Candidates selection will be based on merit in qualifying exams. Preference will be given to OSSTET qualified candidates. When OSSTET qualified candidates are not available then only without OSSTET candidates are eligible. Applications in a prescribed format only accepted for this Malkangiri District SC & ST Development Department High Schools/Govt High Schools TGT Arts, TGT Science, Hindi Teacher, Sanskrit Teachers and PET jobs. Last date to submission of application form to District Welfare Officer,Malkangiri Post/ District. Pin 76445 by registered post is 22-12-2018.